n Carving and painting is tons of fun and so easy! My first pumpkin is just a simple carving and holes cut at the sides with gourds inserted for ears and a gourd inserted for the nose. My construction working pumpkin is a replica of hubby! All our visitors were amused, hubby wasn’t as enthusiastic (hee hee). 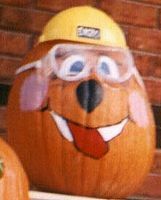 I purchased a child’s construction hat and a pair of safety glass (both at a dollar store) and simply glued them to the painted pumpkin. To paint your pumpkin, regular acrylic paints work great. My pop-eyed pumpkin is another simple carving with gourds inserted for eyes. You can be very creative with this traditional Halloween activity, because there are so many different ways to paint or carve your creations. Copyright © 1999-2015 Susan Spatone All rights reserved.